In March, 1845, a group of eight adults, "satisfied with each other's piety, sentiments and intentions," determined to walk together as a church of Christ. So states the minutes of the first meeting in a schoolroom in the Mechanics Institute on Dundas Street in London, Ontario. By 1850, a building was erected at York and Talbot Streets, although the name, York Street Baptist Church, was not officially adopted until 1877. 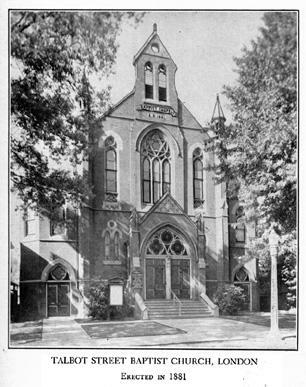 A new and larger church was constructed on Talbot Street, and early in 1882 the congregation began to worship in the Talbot Street Baptist Church. For the next seven decades, the congregation grew in numbers, weathered depressions, survived money shortages and two world wars, saw the turmoil and divisions within the denomination that marked the 1920's, and gave thought periodically to expansion or relocation. A new parcel of land became available, and in 1954 the congregation moved to its present site on Clarence and Richmond Streets. The new location required a new name: First Baptist Church. The appropriateness of this name is readily understood: from the York Street Church came the Adelaide Street Church; from the Talbot Street Church came Maitland Street, Egerton Street, Wortley Road, and Kensal Park Churches; Sunrise and Westview Churches have developed largely through the efforts and support of First Church in recent years. Most of London's Baptist churches can trace their ancestry to the York-Talbot -First Baptist line. In its sixty or so years, First Baptist's building has acquired a distinctive and meaningful character. In the sanctuary, two good musical instruments, a pipe organ and a Yamaha piano are available for use. Podcasts of services are now regularly posted to our web site for those who are unable to attend public worship in the church. A dozen stained glass windows have been placed to the glory of God and as memorials to members. They all depict aspects of Christ's life from the annunciation and birth through the Last Supper, Gethsemane and the crucifixion, the ascension and enthronement. 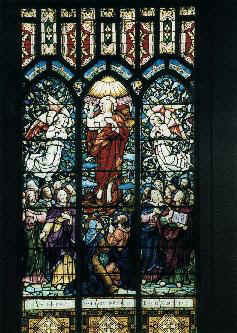 His ministry is shown in windows illustrating Christ as the "fisher of men", as a shepherd, as healer, and as a friend of little children. The ascension window, the only one removed from the Talbot Street building, illumines the wall above the baptistry and the communion table. The basement of the church contains a school hall and classroom, fully renovated in 2009, a well-equipped kitchen, and a gymnasium. Since 1989 we have had an elevator for the use of handicapped people; it allows access to four levels within the building. The kitchen has been rearranged and improved. Outside the church, parking spaces have been allotted for the handicapped, and lawn on Clarence Street and to the north has been changed to a parking lot. The membership rolls indicate that by the time York Street Church was thirty years old it had 244 members. The highest membership figure occurred in 1925: 873 members. At the beginning of 2006 the active membership is 229; we also have a large number of adherents. The members have always held, in the best of Baptist traditions, a wide variety of beliefs. Presently, membership is attained by baptism on profession of faith, by letter from another Christian Church, or on the strength of Christian experience. The future of First Baptist Church will undoubtedly be challenging as we head into the future, yet our confidence is in our God who leads us.